Mr. Przemysław Gromada is the owner of "Marco Polo" Hunting Agency. After having accomplished the Technical Forestry/Sylvan College he graduated from the Agricultural Academy in Poznań, where he studied at the Forestry/Sylvan Culture Faculty. His postgraduate studies were in the field of Business Management at the University of Szczecin. An enthusiast of hunting, hunting traditions and, above all, the sound of a hunting horn. The funder and director of the Representative Band of Hunting Horn Blowers "Gryf" ORŁ in Szczecin (four-time Poland Championship in "B": class Wałbrzych 2002, Pszczyna 2003, Tuchola 2004, Kwidzyń 2006). The Chairman of the Culture and Hunting Promotion Committee ORŁ in Szczecin. 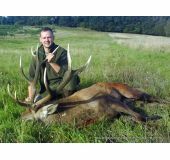 The lector of the Polish Hunting Association in the field of hunting traditions, culture and biology of game. A member of the Social and Science Council of the Forest Promotional Complex "Szczecin Forests" RELP in Szczecin. A field writer of "Brać Łowiecka" ("Hunting party"), responsible for the column of hunting traditions. The author of numerous articles about hunting problems in hunting press and many other works on the subject.